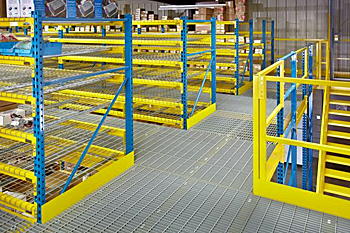 Sometimes called "catwalk systems", these mezzanine configurations are high bay pallet racking with walkways in the aisles between the rack. Other configurations include open mezzanines with floor decking that rests on the pallet rack upright columns for support. The mezzanine framing members (joists and stringers) bolt to the upright columns to create the decking of the mezzanine. 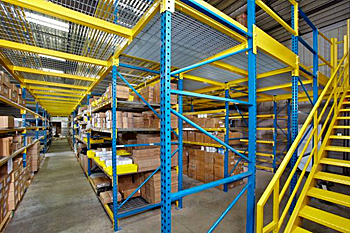 With pallet rack below the floor, the frequency of support columns is higher, making the mezzanine stable and solidly anchored. The advantage of this type mezzanine is the efficiency of using space above your pallet rack to add square footage to your facility. You now have additional floorspace in which to place more pallet rack, office space, work zones or just about anything you like. You gain formerly unusable space by accessing vertical space in your facility to extend your storage or manufacturing processes. Your rack supported mezzanines will be designed by qualified engineers who understand live loading and who make sure the structures they design meet appropriate building code standards. This means the columns must be rated to support both the weight of the mezzanine and the contents stored on the rack at any given time. The framing members will be structurally sound and meet the requirements of ASTM A570-75 Grade E standards. Stringers are directly supported by the pallet rack upright columns, while joists are factory welded to the stringers to retain rigidity and safety. All these design standards lead to a stable, sturdy mezzanine you will find great benefit from for many years to come. Other design elements to consider are stairs, handrailing, catwalks, pallet gates and decking materials. Safety factors like enclosing the mezzanine with handrail, having kick guards and welded steel stairs, all help prevent falls that could result in injury or death. Choosing fire-proof decking materials that allow air circulation help reduce fire hazards as well as allow sprinkler systems to penetrate to all layers of stored items. Pallet gates and catwalks make loading, unloading and accessing goods more convenient while saving time and labor. Additional methods of moving materials such as chutes or conveyors should be considered in planning your mezzanine. 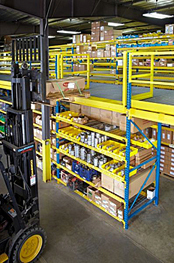 Traditional forklift placement may not be feasible or wise depending on whether you move by pallet loads or less-than-pallet loads to and from your mezzanine. 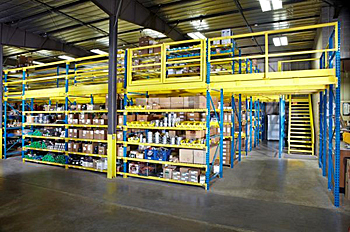 Rack supported mezzanines give you so many options in how to use the space above the pallet rack in your facility. It is an economical choice compared to structural mezzanines, and install fairly quickly, meaning you'll have less downtime and fewer interruptions in your production process. Above all else, you will have increased active floor space available - valuable floor space that lets you expand, improve and optimize.